Singapore Watch» Blog Archive » How much do property agents actually make? 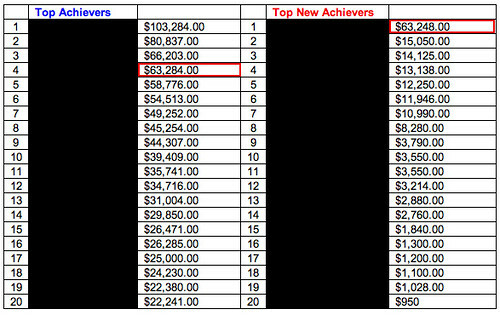 While you look at the above figures, you can imagine what the new comers are making, beyond the “Top New Achievers”. 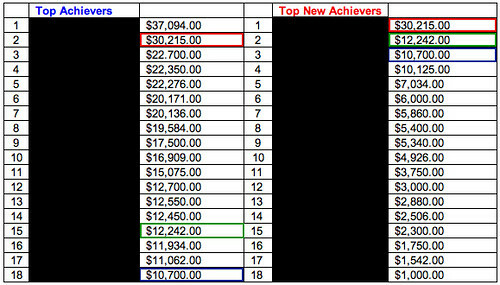 Likewise, you can also see how some new comers quickly propel to the overall “Top Achievers” chart as well. The drop out rate for this industry is more than 50%. That means, within 6 months to 1 year, at least 50% of newly recruited agents would no longer be active in the industry at all. If you do want to be a real estate agent, you have to strive to be amongst the best! If you are not racking in high commissions within 6 months, or at least earning more than what your full-time job used to pay you, this is not the industry for you. THE buoyant property market of the past six months has attracted not just buyers, but also mid-career professionals who have made the switch to become property agents. Industry watchers said there are about 26,000 housing agents here, and the number could hit 40,000 if the positive market sentiment continues. During the lull last year, there were fewer than 20,000. ERA Asia-Pacific had 45 per cent more new hires in the first half of this year, compared to a year ago. PropNex is getting about 200 new agents a month, compared to 165 during the 2007 boom. One pull factor is the higher commissions from private property sales as property prices continue to climb. ERA Asia-Pacific associate director Eugene Lim said: “If they do property sales, an average per month is currently about $6,000 to $7,000. For private property rental, which some new people start off with, you can get average of $3,000 to $4,000 for a deal. PropNex Realty’s CEO Mohamed Ismail cited the example of an agent who was a Singapore Airlines crew member for 19 years. Concerned about being retrenched, she attended Prop Nex’s courses earlier this year, and started work at the end of May. “In the last 2.5 months, she closed transactions worth about $87,000,” said Mr Mohamed. Property agencies said they are also seeing more professionals with postgraduate qualifications joining the industry. Property sales are on the rise: Transactions of HDB resale flats were up 50 per cent in the second quarter, while the number of new private homes sold in Q2 was more than the total figure last year. But in a boom period, agencies also advise homebuyers to be cautious of rogue agents. “In any business, there will always be rogues. This will tend to increase when the transaction volume increase and also when the market is going up,” said Mr Lim. This entry was posted on Thursday, July 30th, 2009 at 11:20 am and is filed under Housing, Singapore Watch ver 2.0. You can follow any responses to this entry through the RSS 2.0 feed. You can leave a response, or trackback from your own site. They make large sum of money. Yes, like what the Director & CEO have mentioned. There is possibility in making those kind of income. The top 10/20% have made it caused they clearly know how much they want to make instead of what will be handed to them (like salary?). in the eyes of public, they will think all property agent make big money. but the actual facts is only 10-20 percent agents of the more then 40000 agents now are making money. the rest are either making abit more then their previous job or same amount as their previous job but with more free time and alot are even struggling to make end meets. this market is getting more and more competitive as more and more agents are flowing in. and this piece of cake is being shared by more and more agents which means lesser or even no share for some. so dont think all agent make big money. not just in the real estate industry. It is true, the property market has been quite cool since the new rule implemented on Jan 2011. I think it is going to cool down further. It is right that only the developer are making money now on private residential…. Only the thing to note is that the real estate sector (and insurance) is unlike all other industries, as they are fully commission-based and have no base salary. Thus you have to strive to be among the best, or find another job. True, either you take almost….. all or left with almost ….. none in this 2 industries you mentioned. So depends whether you want to become a fisherman out in the open sea or a fish farmer in the coastal sea. I think it’s about profiting and profiting only. All hardworking agents will make a decent income. I wanna be a property agent but doesnt know how to apply for it and how the process goes.. Anyone can help me or share with me.